The People's Uber service in China can be a cheaper option over taxis. Facing little work in his regular construction job, Li Gengming has become a big supporter of Uber Technologies in China. He is just one several private drivers who have signed up with the ride-hailing service in Beijing. Each day, Li picks up around 7 or 8 customers, taking about 200 yuan (US$32) from the rides altogether. "There are not enough taxis in the city, so there's demand," he said on Monday. "Uber is also much cheaper than taxis." In China, however, not everyone is a fan of the service. Last Thursday, police reportedly raided Uber's office in the Chinese city of Guangzhou, for letting private drivers operate without the needed qualifications, according to local media reports. Uber has said its cooperating with the authorities. But the police raid could mean it will face more regulatory trouble in China, as it tries to expand across the market. Last week's raid wasn't exactly a surprise. Back in January, China's Ministry of Transport declared that private car owners -- or those without taxi licenses -- should be banned from using ride-hailing apps. In spite of the restriction, Uber continues to operate. This is partly because it works with licensed vehicle-rental firms in China, to sidestep the ban and deploy its drivers. But in addition, the company still offers a "People's Uber" service, that lets private car owners connect with customers in need of a ride. Uber declined to comment on whether the service might be shut down. But Li, a driver with People's Uber, isn't worried. "It's a way for us to make money," he said. "If the people support it, then I think the government will give some room for Uber to exist." 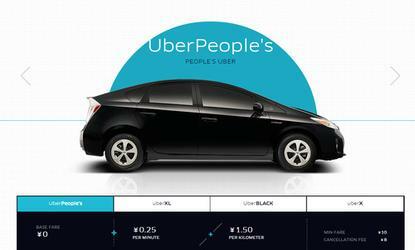 The U.S. company has said that its People's Uber service is not for profit, and that riders only pays drivers' costs. According to Li, Uber also subsidizes drivers, paying them an additional 10 yuan for each ride they make. "We aren't quite clear how Uber is making money from this," he added. But it's a good deal for consumers. IDG News Service took one ride with Li, and found it to be 10 yuan cheaper than the return ride with a Beijing taxi. Whether this service will last will be up to Chinese regulators. The government is expected to come up with clearer rules on the market, which could mean Uber drivers will need certification to continue working, said Mark Natkin, managing director of Beijing-based Marbridge Consulting. Life is not easy for outsiders like Uber, according to Zhang Xu, an analyst with research firm Analysys International. "Historically, foreign Internet companies have struggled in China," he said. "But Uber could be different. It has the support of Baidu." That support arrived last year, when Uber announced that China's leading search engine had become a strategic partner. Baidu has much experience navigating China's strict rules on censorship and government regulations, so the company could help Uber do the same. "If Uber did not have this investment from Baidu, I would consider its position more precarious," Natkin added. "It puts them in a better position from a regulatory standpoint, but it's not bulletproof." The country is also already saturated with local competition. The country's two largest taxi-hailing apps in China merged earlier this year, and Uber itself still has a smaller presence that's been focused more on English speakers.